They sent Judy, the firefighter, off to training all by herself. Her bosses did what a lot of companies do: They identified her skill gaps, found a program to fix her problems, and checked the box. Judy was ecstatic when she returned to her department: She couldn’t wait to put into action what she’d learned. The next day the fire bell sounded and off the team went. Except the outcome was not what was expected: The skills Judy had gained were visible to no one – including Judy. The bosses had made an error. The above story is fictitious. 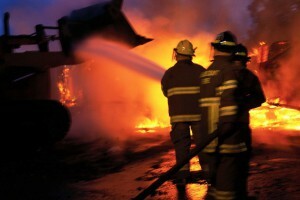 There is no “Judy the Firefighter.” The training approach, however, is a reality: Scores of employees are sent to individual training every day, but because what they learn is outside the powerful dynamics within work cultures, any hopes for changes in behaviors burn away the moment said employee returns to the firefighting mode of daily work. The list of casualties, including motivations and improved performance, is long. If a company expects Judy to show big progress in her development, then her individual leadership development should be done in concert with the team’s development. The culture and systems Judy works in demand it. How will your team improve together?